Details: This portrait is of Francis Turner of Wellesly, County Warwick. A note to this effect is on an old label on the stretcher. It is in fine, relined, condition. A very fine looking portrait of a handsome young gentleman in a feigned oval. This is a good example of work of the circle of Arthur Pond, but not fully attributed. Pond was an important and fashionable London artist of the first half of the 18th century. Pond studied at the Vanderbank Academy in 1720, and then in Rome 1725-1727. He set up practice in London and became one of the most fashionable portraitists of the first half of the 18th century. He worked with Thomas Knapton in his publishing business and it is very difficult to distinguish between their respective portraits. He was a great connoisseur and an important art dealer. He was elected FRS and FSA in 1752. His pupils were George James and Mary Black. 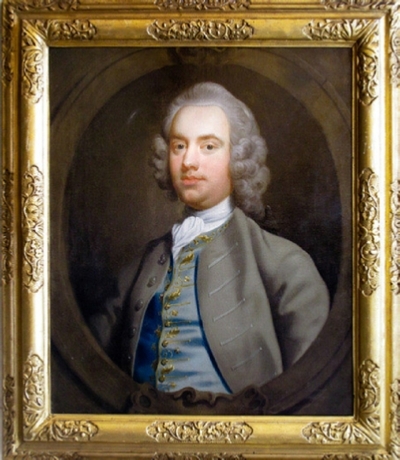 He died in Rome in 1758 and is buried at Sanderstead.